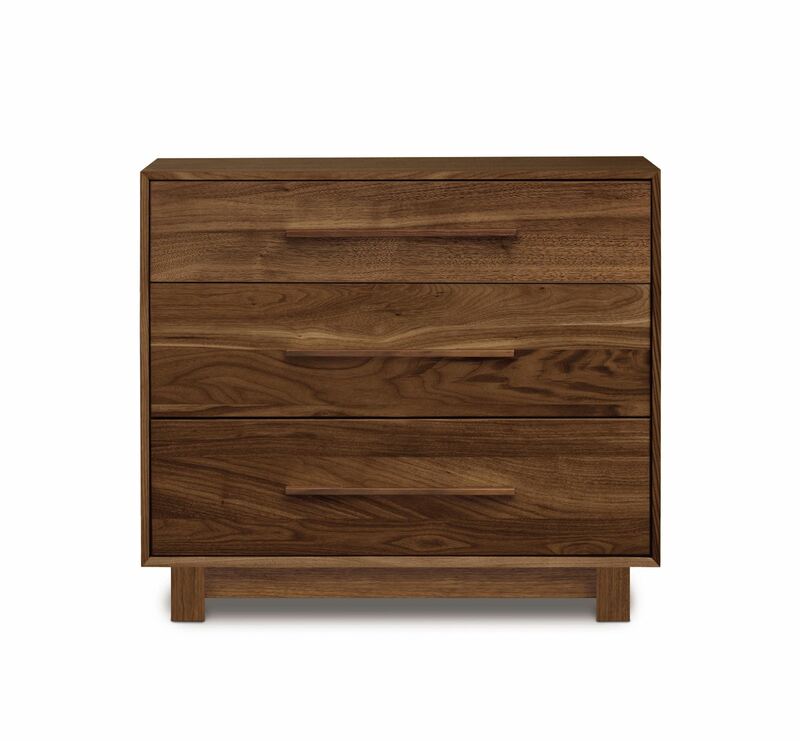 The Sloane 3-Drawer Chest is crafted in walunt. You can also select from a variety of pull options for the drawers. The rectangular block pull is standard and is what's shown in the photos. Copeland finishes are GREENGUARD CERTIFIED. 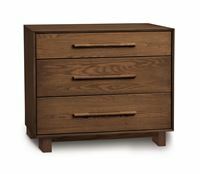 Copeland craftsmanship is on display with each drawer made using dovetail joinery. This is the gold standard in drawer quality. Typical factories will simply utilize glue and staples to make a drawer joint. Copeland takes the time and effort to perfectly fit each panel together with joinery that stands the test of time. 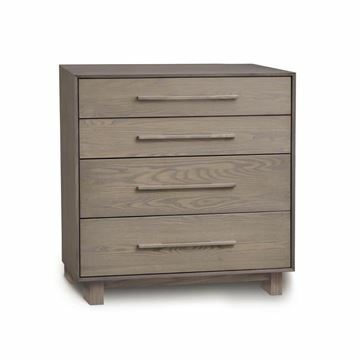 The Sloane Four Drawer Chest by Copeland Furniture. This handsome chest of drawers is crafted in beautiful Ash Wood. The top two drawers are smaller than the bottom two, which gives you better options for detailed organization. 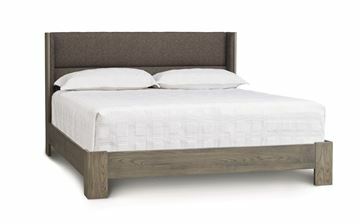 It can be used as a large scale nightstand, or as a convenient storage chest in any room. 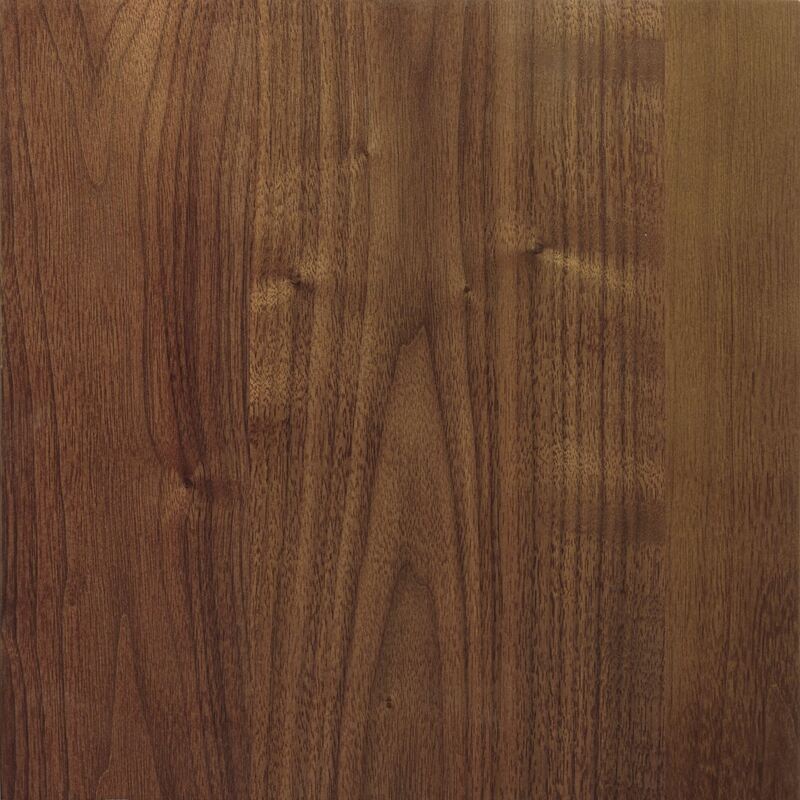 Ash is a North American wood, and has a beautiful pronounced grain. And the ash wood can be finished in five different stains. The drawers feature soft closing drawer glides. The drawer sides, back, and bottoms are crafted in solid hardwood and feature dovetail joinery. This is a hallmark of American quality and craftsmanship. Please see more details below. 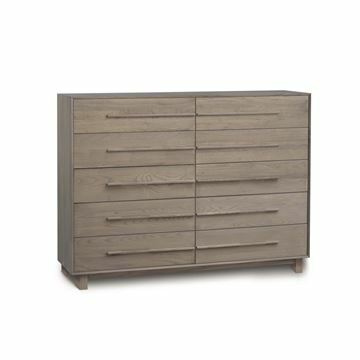 The Sloane Five Drawer Narrow Chest by Copeland Furniture. 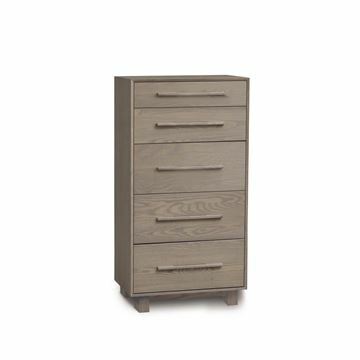 This handsome chest of drawers is crafted in beautiful Ash Wood. The top two drawers are smaller than the others, with the top drawer being the smallest. This design feature gives you better options for detailed organization. It can be used as a companion piece to a dresser, or as a convenient storage chest in any room. 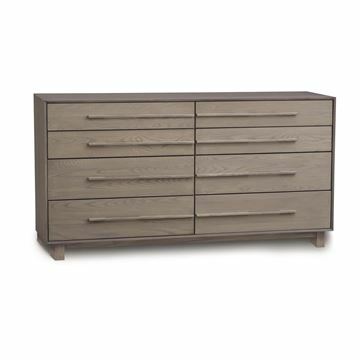 We have several customers who arrange two and at times three tall chests of drawers next to each other, creating a dramatic wall unit look with tremendous organized storage capacity. So far as the wood, Ash is a North American wood, and has a beautiful pronounced grain. And the ash wood can be finished in five different stains. The drawers feature soft closing drawer glides. 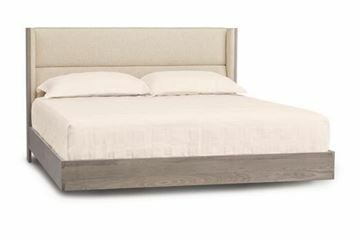 The drawer sides, back, and bottoms are crafted in solid hardwood and feature dovetail joinery. This is a hallmark of American quality and craftsmanship. Please see more details below. 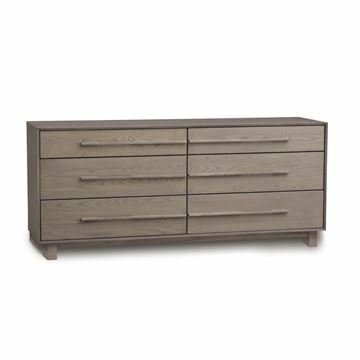 The Sloane Five Drawer Wide Chest by Copeland Furniture. 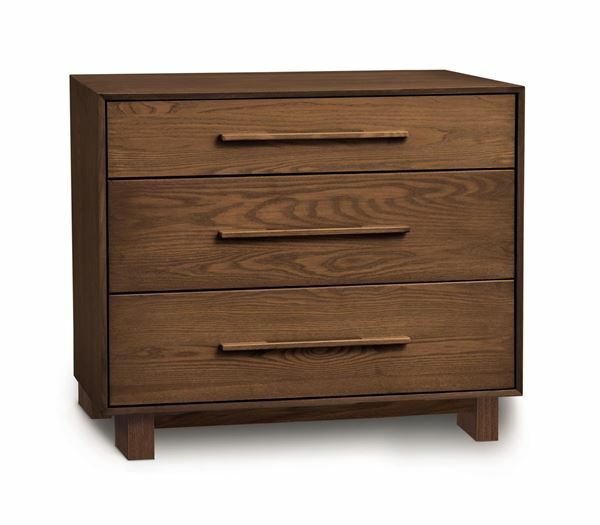 This handsome chest of drawers is crafted in beautiful Ash Wood. It can be used as a companion piece to a dresser, or as a convenient storage chest in any room. We have several customers who arrange two and at times three tall chests of drawers next to each other, creating a dramatic wall unit look with tremendous organized storage capacity. So far as the wood, Ash is from North America, and has a beautiful pronounced grain. There are five different stains available. 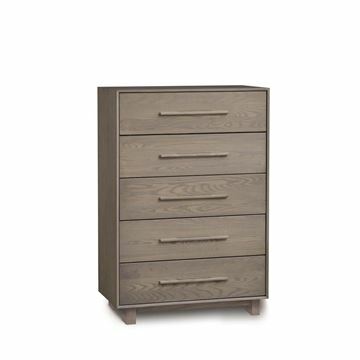 The drawers feature soft closing glides. The drawer sides, back, and bottoms are crafted in solid hardwood and feature dovetail joinery. This is a hallmark of American quality and craftsmanship. Please see more details below.